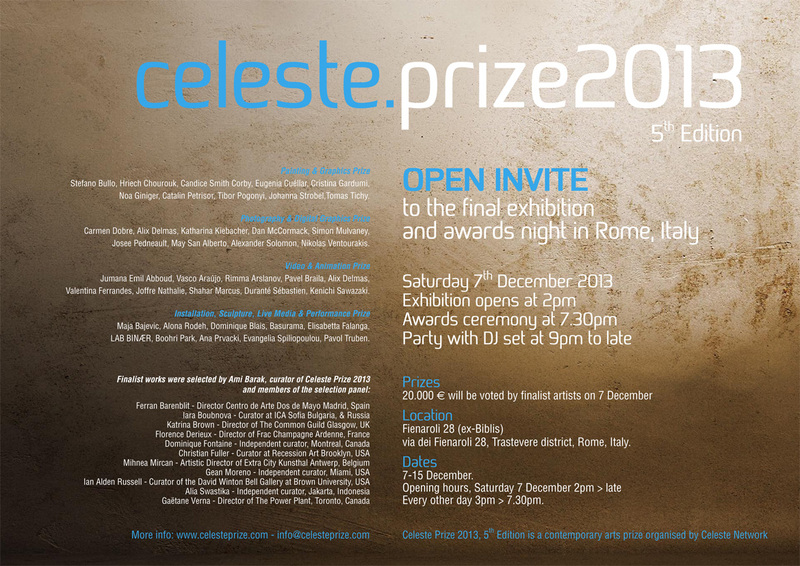 The Celeste Prize is an international contemporary art award organised by Celeste Network in which artists from allover the world can participate. On Saturday 7 December hundreds of arts lovers gathered with Celeste Prize finalists and the prize curator Ami Barak to determine with their votes this year’s winners who received 20,000 € in cash prizes. The selection of the 40 finalists and the 80 shortlisted works for the prize catalogue were made by the Selection Panel of 11 international curators and art critics and by Ami Barak. Each member of the Selection Panel has published online his or her 5 favourite works in each of the categories of the award. The 10 artists in each category whose works received a majority of votes were admitted to the final exhibition and prize voting in Rome on 7 December. Read critical texts and motivations for choices.